Klopp to the Kop, or Faith in Rodgers For Reds? Liverpool were dealt another seismic setback to a miserable season when their woes were exhibited in the semi-finals of the most prestigious domestic cup in football. Not only did the Reds exit in a despondent manner to a side hovering above the warzone of the relegation slugfest, they ended the dreams of a fairytale Steven Gerrard swansong for his last fixture with the club of bowing out with FA Cup glory. It was hardly an exit through a harsh or valiant battle, either. Instead, the Merseyside contingent were utterly outplayed. Their game was epitomised by Kieran Richardson's goal line clearance to deny Steven Gerrard's header—so close, yet so far. On more than one occasion in this season, Brendan Rodgers has left the media and fans alike baffled over his comments. The Irishman banked another one of those head-scratching statements to his collection, describing the skipper's performance as "excellent. Like the rest of his teammates, it was anything but. Lacked of creativity and parched of desire, the Merseyside contingent were comprehensively outplayed by Aston Villa, undone by Fabian Delph's second-half strike to further weaken the walls around the tenure of Brendan Rodgers as Liverpool manager. "Get Gerrard to Wembley" was a success, in the most technical of terms. The former England captain braced the stage of the national stadium, although he and his team would end up profoundly underwhelming. They got him to Wembley, but they played like a team who didn't deserve to be there. Rarely grasping control of the game, Nathan Baker's injury provided a minuscule opening in which Liverpool pounced on, as Philippe Coutino bagged a goal on the half-hour mark—one positive among the scarce few taken from them in the game. Instead of being an individual loss, or just one dead end on the road to a cup, it was a recurrence. We've seen it before this season: Gerrard playing deep, Lovren at the back and Glen Johnson featuring at the wrong time—it was the problems from the loss at Selhurst Park, once deemed a turning point, which came back to haunt them, effectively at their own doing, or at least, Rodgers'. Considering the fact that last season was just a freak season—and Luis Suarez powered their finish to second place—is something fans of the club have been pushed to accepting when each tragedy strikes. Over the timeline, belief in what they can do has depleted, and faith in Brendan Rodgers is running extremely thin. Following up a season in which Liverpool had one hand on the illusive Premier League title, failing to retrieve a top-four finish and no silverware shows a handful of crippling steps back. Even if they did lose the world-class talent that was Luis Suarez, they levelled the load by splashing the cash on signings of who haven’t been able to perform up to the mark at Anfield. Mario Balotelli let everyone know on his Instagram that he was infuriated with the offside ruling denying him a goal opportunity that would have flipped the semi-final on it’s head. The Italian was through on goal, and did put it in the back of the net when the linesman’s flag was raised, but there would be no second goal for the Kopites in their Wembley close-up. While the number #45 had a better game than most in comparison to his inaugural season with the club, one new-signing who certainly didn’t was Dejan Lovren. His woes were typified by a reckless shot from over 30-yards out in a last-ditch attempt to salvage their cup dream. With such on-demand talent in their realms, it hasn't helped this situation. The whole Raheem Sterling saga—from laughing gas to contract disputes—is a crystal clear indication of an underlying problem around the management of Brendan Rodgers. It may be ill-advised to pin all the blame on the manager, as he does not control the dials of morale and passion at his fingertips, but when you are in charge of a football club, especially with the ambitions of the stature of Liverpool, your neck is constantly on the line. Is it time for Brendan Rodgers to depart? Had Jürgen Klopp not announced last week that he was set to leave Borussia Dortmund at the end of the season, the calls for Liverpool's current man in charge to exit would be far quieter. As the first Liverpool manager to fail to win a trophy in his first three seasons, there's no shaking off the facts. The record books—and many memories for that matter—don't retain space for the nitty gritty details, whether that inspired win-streak got the hearts pulsating, or their delightful football became a spectacle, nothing is remembered when it comes down to the trophy cabinet, and they never lie. It's a rare opportunity, and the future management of the club has such speculation. Jürgen Klopp is undoubtedly a perfect fit to hold the reins at Anfield, but what Rodgers has done—even if it isn't trophies—it, for now, holds a dear place in the hearts of the Kop faithful. "I have had no contact with another club, but I am not planning a sabbatical," an emotional Klopp told the media following his announcement. The German is targeting a club to manage next season, so any dissatisfaction may not be carried forward with Rodgers when an ideal manager awaits. It's one huge dilemma—everything will be under the microscope on the run-in to the end of the campaign. Who should be the Liverpool manager? Klopp's innovative employment of the bespoke "Gegenpressing"—pressing the opposition right after losing the ball—suits this Liverpool team perfectly. Pressing has been rifled across the press conferences of Brendan Rodgers in the season, but a lot of that has just organised the chaos from the varying formations used. Not only that, but his character seems a perfect fit not just for Liverpool and Anfield, but the entire Premier League in general. He will bring a dynamic onto this side and reinvigorate the vibes that fill each Reds' player with pride from the rumbling of the Kop End. But one cannot overlook Rodgers easily. There are other reasons to his failure beyond his control. Whether Liverpool want to surrender all of that for Klopp ponders the question, is he worth it? Many would certainly agree. In an ideal world, Rodgers moving as a No.2 to Klopp would end that dilemma, but it's doubtful he would accept demotion from manager to assistant—few would. At the end of the day, Liverpool have significantly underachieved this season, and that's with a few weeks remaining. The manager must take responsibility for that, and the powers above must acknowledge it. Missing the opportunity of Jurgen Klopp could be a mistake regretted for years to come. Will Liverpool put away the fantasies of last season in replacement for a man who can take them further? 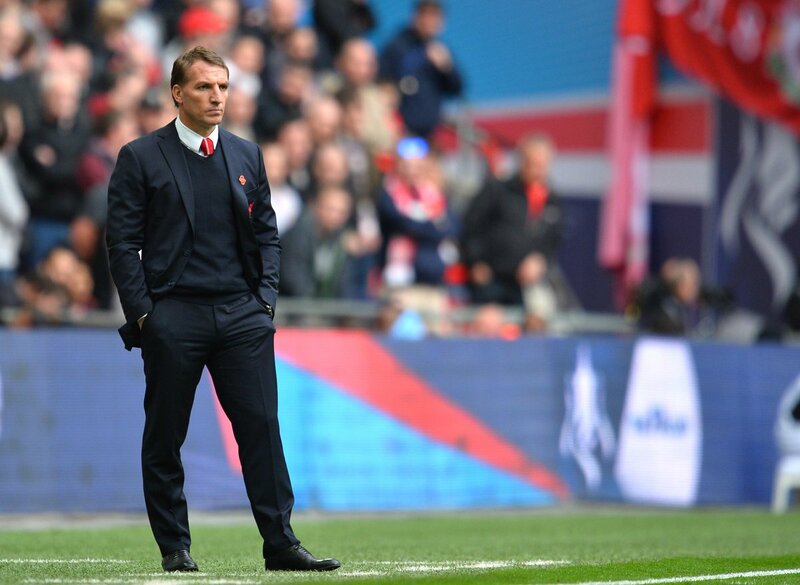 TheSportMatrix • We Live For Sport: Klopp to the Kop, or Faith in Rodgers For Reds? After they woefully exited the FA Cup, is it the final nail in the coffin of Liverpool's season—and Brendan Rodgers' career? Should the Reds angle for Jurgen Klopp?